The Toll of the Sea is a 1922 American silent drama film directed by Chester M. Franklin, produced by the Technicolor Motion Picture Corporation, released by Metro Pictures, and featuring Anna May Wong in her first leading role. The film was written by Frances Marion and directed by Chester M. Franklin (brother of director Sidney Franklin), with the lead roles played by Wong and Kenneth Harlan. The plot was a variation of the Madama Butterfly story, set in China instead of Japan. The film was the second Technicolor feature (after 1917's The Gulf Between), the first color feature made in Hollywood, and the first Technicolor color feature anywhere that did not require a special projector to be shown. Lotus Flower has a young son, whom she names Allen after his father. When the older Allen finally returns to China, Lotus Flower is at first overjoyed. She dresses in her elaborate Chinese bridal gown to greet him. However, he is accompanied by his American wife, Elsie. Allen has told Elsie about Lotus Flower, and it is Elsie who persuaded her husband to tell Lotus Flower the real situation. When the boy is brought to see his father, Lotus Flower pretends he is the child of her American neighbors. 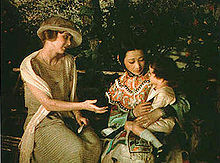 Later, though, she confides the truth to Elsie and asks her to take the boy to America. She tells the child that Elsie is his real mother. After Elsie takes the boy away with her, Lotus Flower says, "Oh, Sea, now that life has been emptied I come to pay my great debt to you." The sun is then shown setting over the water, and it is implied that Lotus Flower drowns herself. Because the Technicolor camera divided the lens image into two beams to expose two film frames simultaneously through color filters, and at twice the normal frames per second, much higher lighting levels were needed. All scenes of The Toll of the Sea were shot under "natural light" and outdoors, with the one "interior" scene shot in sunlight under a muslin sheet. Believed to have been lost, it was restored by the UCLA Film and Television Archive, under the supervision of Robert Gitt and Peter Comandini , from the 35mm nitrate film original camera negative in 1985. As the final two reels were missing, Gitt and Comandini used "an original two-color Technicolor camera" to shoot a sunset on a California beach, "much as the film's original closing must have looked." Because modern film technology was used to create a color print instead of the original Technicolor Process 2, which involved cementing together two film strips base to base, the resulting image quality is better than the original prints appeared. The restored version is available as one of the titles included in the 4-DVD box-set Treasures from American Film Archives, 50 Preserved Films. ^ "Film Screenings (June 7, 2015)". Museum of Modern Art. Retrieved July 6, 2015. ^ "The Toll of the Sea". silentera.com. ^ a b Slide, Anthony (January 1, 2000). Nitrate Won't Wait: A History of Film Preservation in the United States. McFarland. p. 109. ISBN 9780786408368. Retrieved July 8, 2015. Wikimedia Commons has media related to The Toll of the Sea. This page was last edited on 9 December 2018, at 18:30 (UTC).